If you don't have a cheese mold, you can use two layers of cheesecloth inside of an empty 35.3 oz. yogurt carton. First, poke a lot of little holes in the bottom of the tub. I used a metal shish kabob skewer. I think I poked it about 20 times each from the inside and the outside. In a medium bowl, thoroughly blend cream cheese, cottage cheese, sour cream/yogurt and butter. 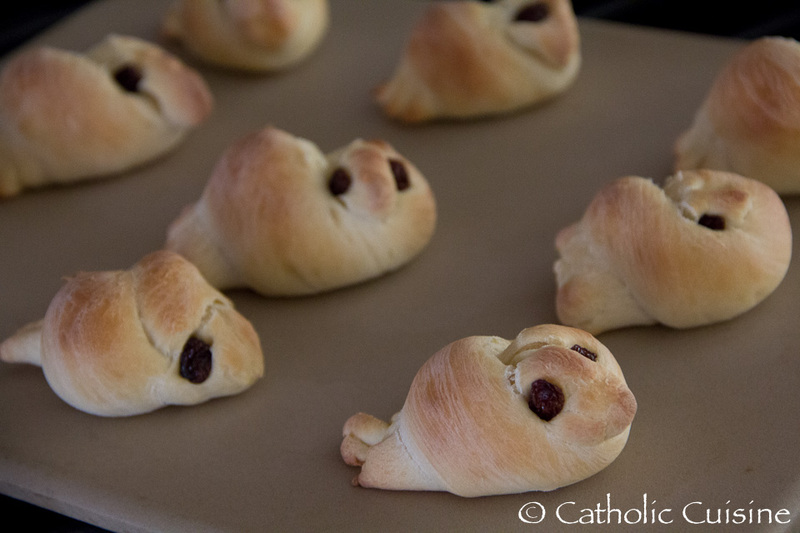 Fold in sugar, extracts, almonds and currants. Scoop your cheese into your prepared mold. I recommend folding paper towels or kitchen towels and setting your tub of cheese on top of those to help soak up the extra liquid. Refrigerate overnight. You might want to change the towels out once or twice before unmolding. When you are ready to serve, place the upside down tub on a plate and remove tub. Carefully pull the cheesecloth off. Decorate if you want to. 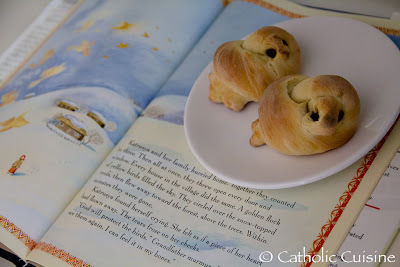 After reading a Ukrainian folktale to my girls this morning, we got busy baking our Hot Cross Buns for Good Friday, Easter Doves, and Paska! 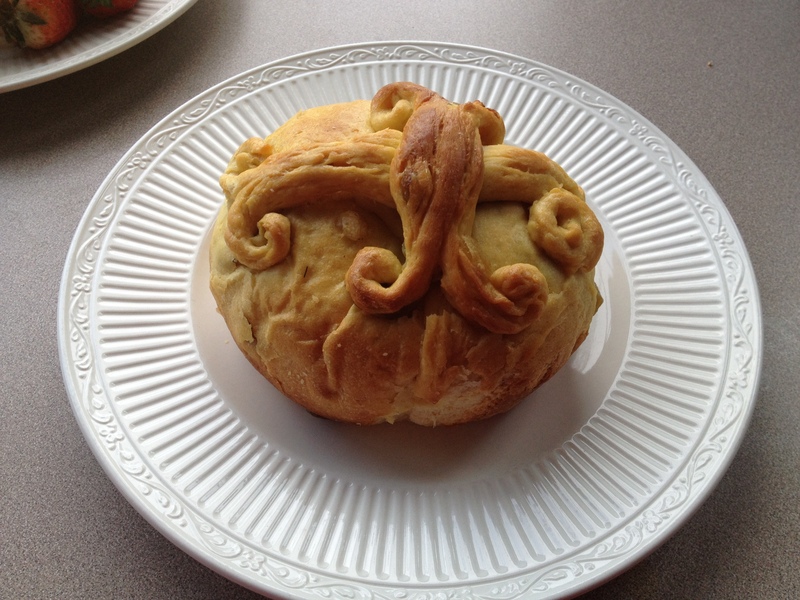 Jennifer recently posted her beautiful Paska recipe, but since I didn't have all the ingredients necessary, and I wasn't going to be able to make it back to the grocery store, I decided to adapt "Mary Urim's Paska" recipe from Romancing the Stove incorporating some of the decorating tips from Ukrainian Classic Kitchen. I just love how pretty the Paska turned out, and it smells heavenly! 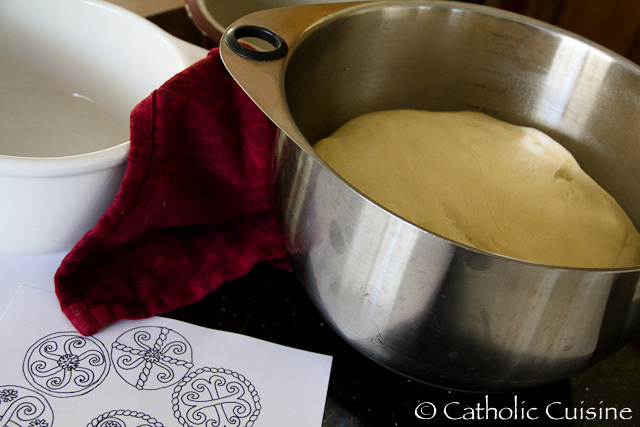 In a small bowl, dissolve the yeast in lukewarm water. Let stand for 10 minutes. Meanwhile, scald the milk. Add the sugar, stirring with a whisk until the sugar has dissolved. Remove from heat, and let cool. In another bowl, mix 3 eggs (saving one for the egg wash), butter, oil, and salt. Add the yeast mixture, and milk mixture, and whisk to combine. 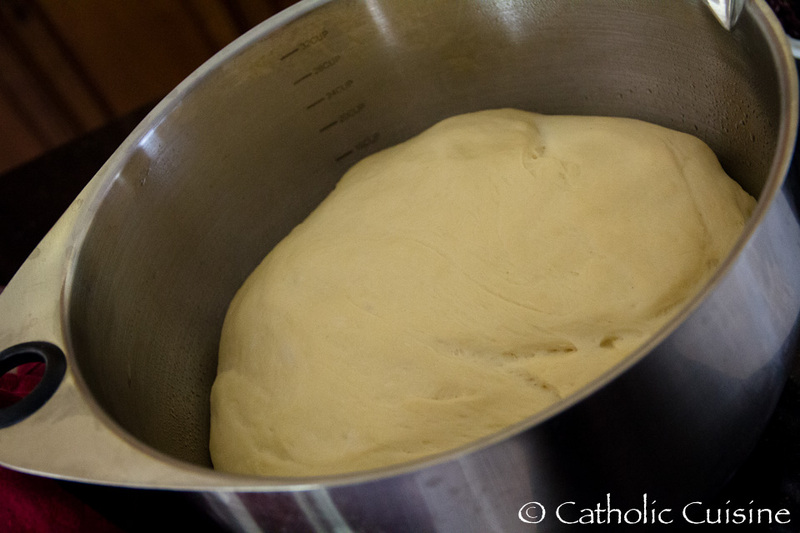 Place the dough in a large bowl coated with oil, turning to cover all sides of the dough with oil. Cover with a towel and let rise in a warm place until doubled in bulk (about 1-2 hours). 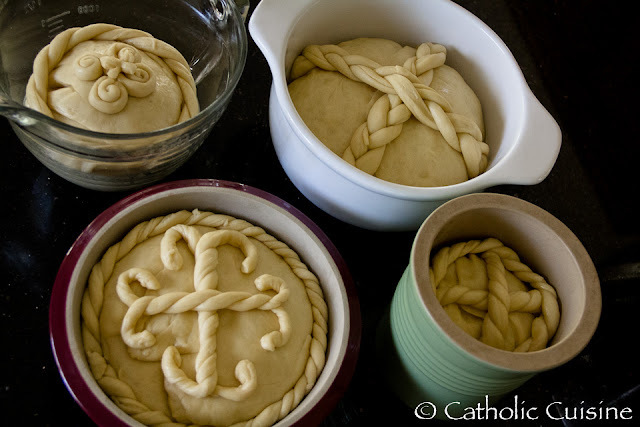 After the dough has risen, take it out of the bowl, punch it down a little, and shape into loaves, reserving a little dough to create decorations. Place loaves into well oiled round baking dishes, filling only 1/3 full. Cover with a towel and let rise in a warm place until once again doubled in bulk (about 30-45 minutes). Note: I had to be creative finding deep round baking dishes! I ended up using an Oven-proof Batter Bowl, a white casserole we were given for our wedding, my new Round Covered Baker, and an old Pampered Chef Bread Crock! Meanwhile create decorations for the top of the paska. Note: Adding decorations after the shaped Paska has risen prevents the decorations from rising unevenly. To make a braided cross: Using 3 small pieces of dough, roll each piece into a rope, then braid the 3 pieces together. Repeat to make a second braid. Place one of the braids over the dough ball in the pan, tucking the sides under the ball. 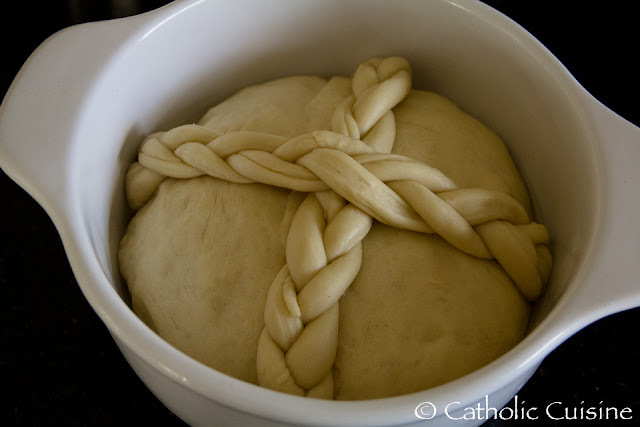 Place the second braid over the first in the form of a cross, again tucking the ends under the dough ball. Additional decoration suggestions/designs can be found in Jen's post. Preheat the oven to 350˚F. Make egg wash - beat 1 egg and 2 tablespoons of water. 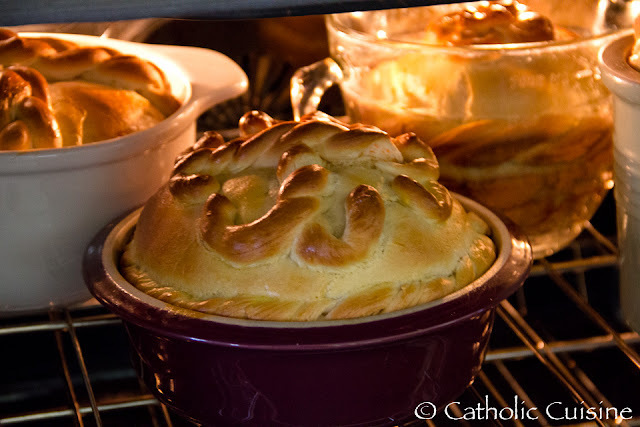 Brush the tops of the loaves with egg wash. Bake for 45 minutes or until the bread is golden. Remove from pan, place on wire rack and cool completely. NOTE: This recipe will create 2-3 Paska, depending on pan size. 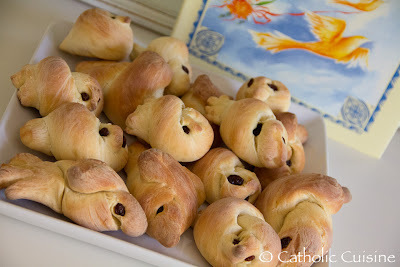 I used the leftover dough from our Easter Doves to create a 4th small Paska. 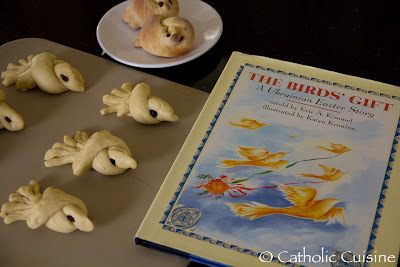 This morning I asked my girls to choose a book for us to read from our Lent and Easter Book Basket and they picked The Birds' Gift: A Ukrainian Easter Story. This sweet book, unfortunately out of print at the moment, is a folktale describing the origin of pysanky. 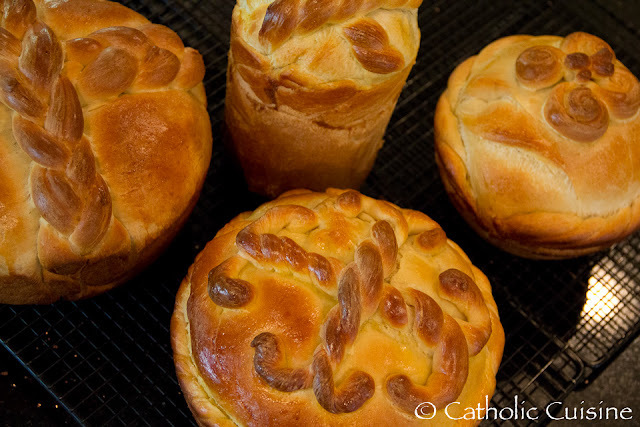 After reading the story we were talking about other Ukrainian Easter traditions and decided to add Paska to our Easter menu this year. We also learned that in earlier times in Ukraine "birds made from dough were baked representing the larks, who were migrating back to the north. Today, these bread “doves” are seen made for Easter. " 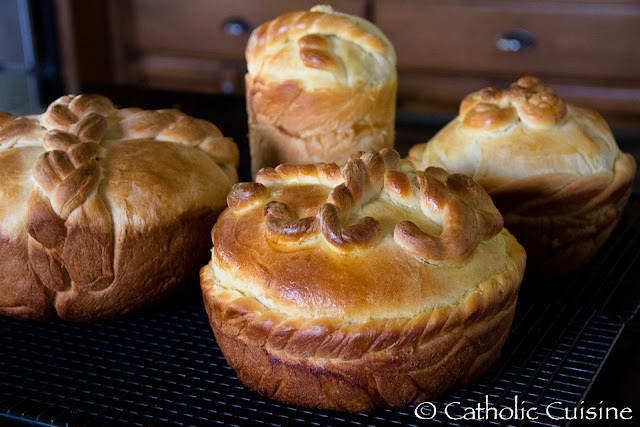 I posted the recipe we used below, but you could also save some dough from your favorite paska recipe, or even make Dinner Roll Doves out of Rhodes Rolls! Ours didn't turn out as well as I would have liked - you have to look at them just the right way to see that they are actually birds - but the children are looking forward to enjoying them with our Easter dinner! In a small bowl, dissolve yeast and honey in lukewarm water. Let stand 10 minutes till yeast begins to work. Beat eggs until foamy. Add the honey, oil, milk, and salt, and beat until well mixed. Add 2 cups of the flour and blend in well. Knead in by hand the 3 additional cups of flour or enough to make a workable dough. Knead until smooth and elastic. 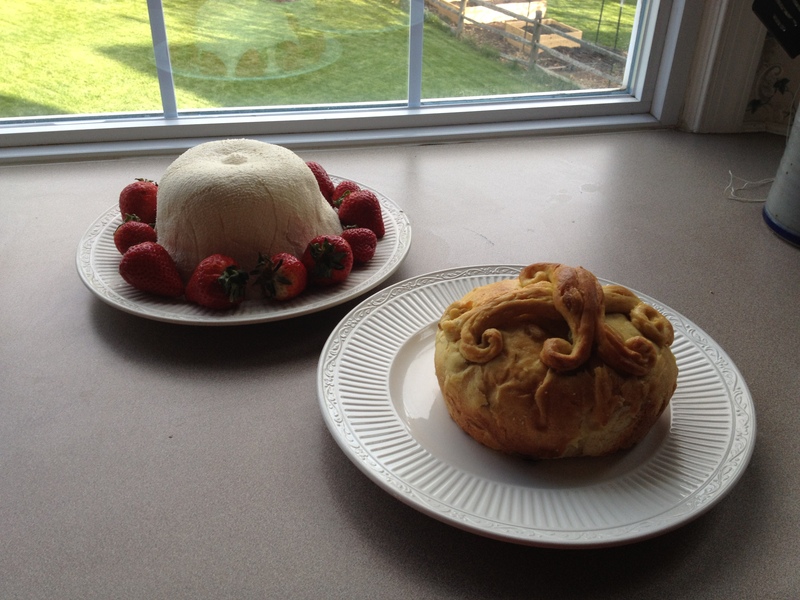 (I used my stand mixer with the dough hook.) Place dough in a greased bowl, cover with a towel, and let rise in a warm place until doubled in bulk. 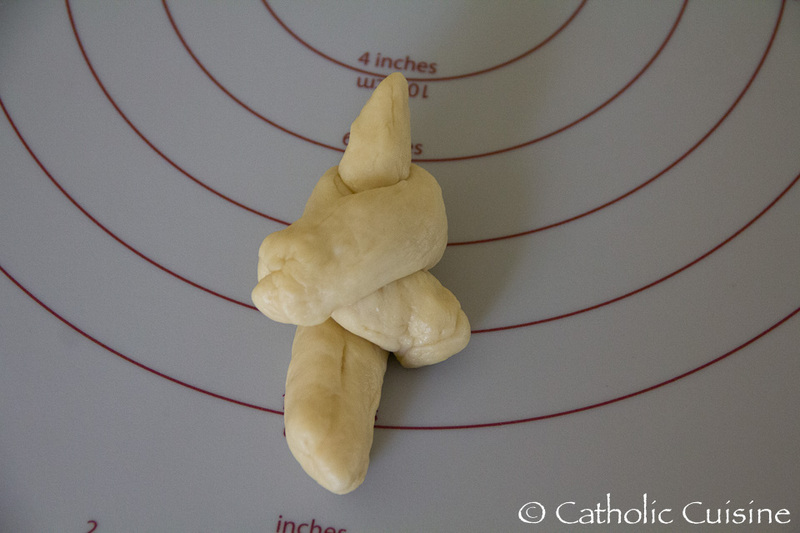 Shape doves; place on greased cookie sheet and let rest 10 to 15 minutes. (The doves will keep their shape best if they are not allowed to rise too long. They will rise some in the oven.) Just before baking, insert cloves or raisins (push in deeply to avoid burning or popping out) for eyes. Brush with an egg yolk wash and sprinkle with coarse sugar, if desired. Bake at 350˚ F for 25 minutes or until golden brown. 1. 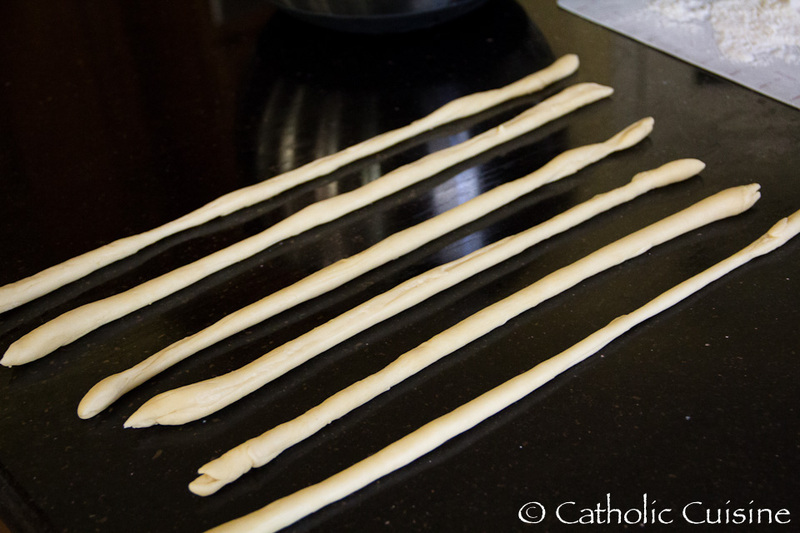 Roll out the dough into snakes about the thickness of a finger; cut into 4 inch sections. 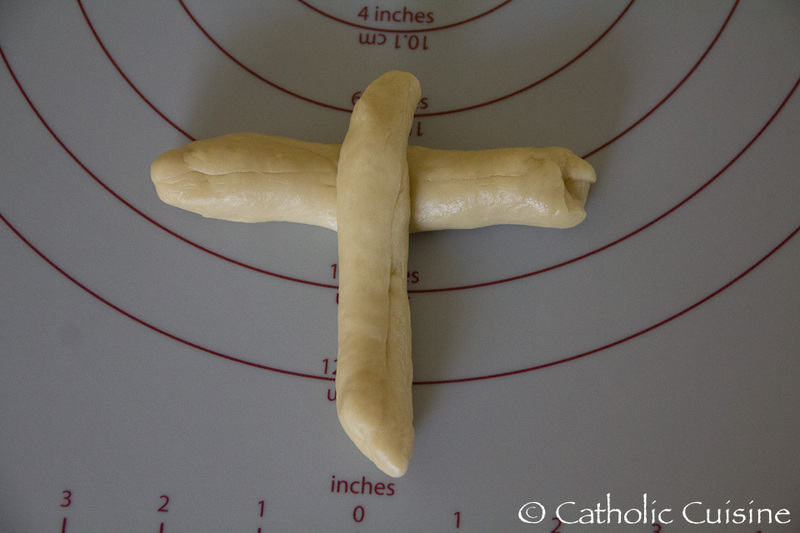 Place one strip horizontally on your work surface; lay another strip on top like a cross. Pull the arms of the strip beneath up and cross to the opposite side) left side becomes right, right side becomes left); flatten and shape slightly as for wings. 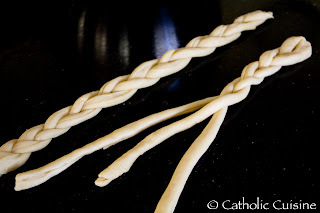 Shape one end of the straight strip of dough like a head (pinch for a beak); flatten the other end and make three or four slits for tail feathers. 2. 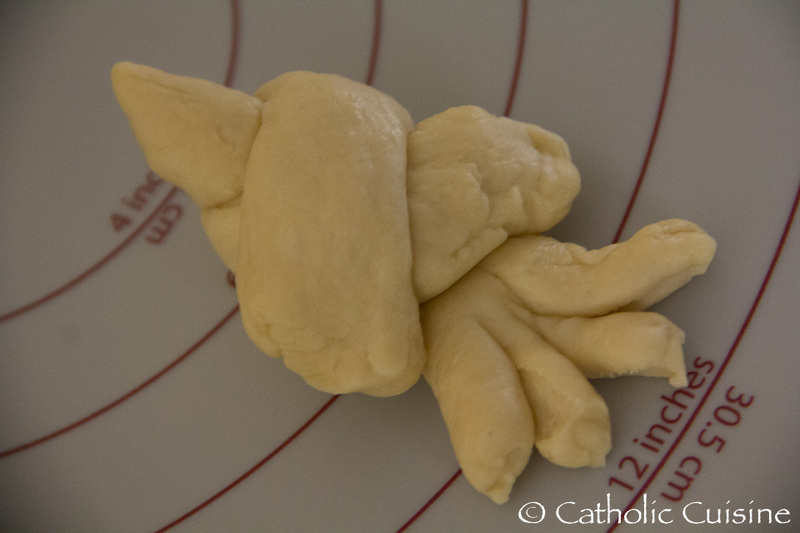 Roll out the dough into snakes about the thickness of a finger. Cut in strips 5-6 inches long, tie each in a knot. Shape one end like a head (pinch to form beak); flatten other end to make three or four slits to form tail feathers, spreading them apart a bit. 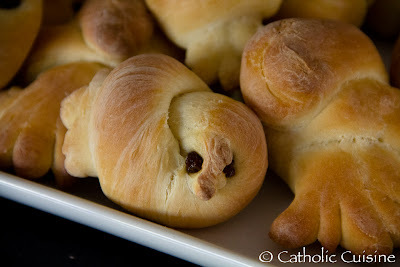 NOTE: I only used some of the dough to bake a couple batches of the Easter Doves. I used the remaining dough to make an extra loaf of Paska! The following post was submitted by Summer from Home. Thank you Summer! 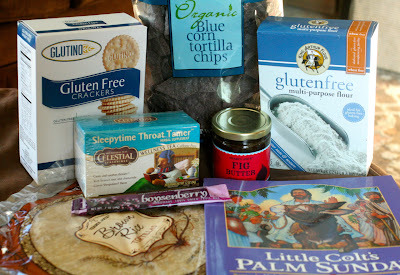 Palm on the Road- read Little Colt's Palm Sunday book, always gf! In a large measuring cup, mix wet ingredients together. Pour into dry ingredients. Batter will be moist and very thick. Evenly spoon batter into muffin tin. Lightly flatten the tops of biscuits using fingers dipped in milk. Bake for 22 - 25 minutes or until golden brown. Serve warm or cool. 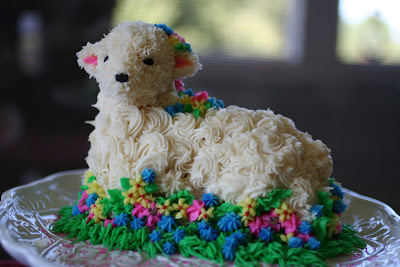 Will be spent baking our traditional Lamb Cake, just with GF Betty Crocker helping out. 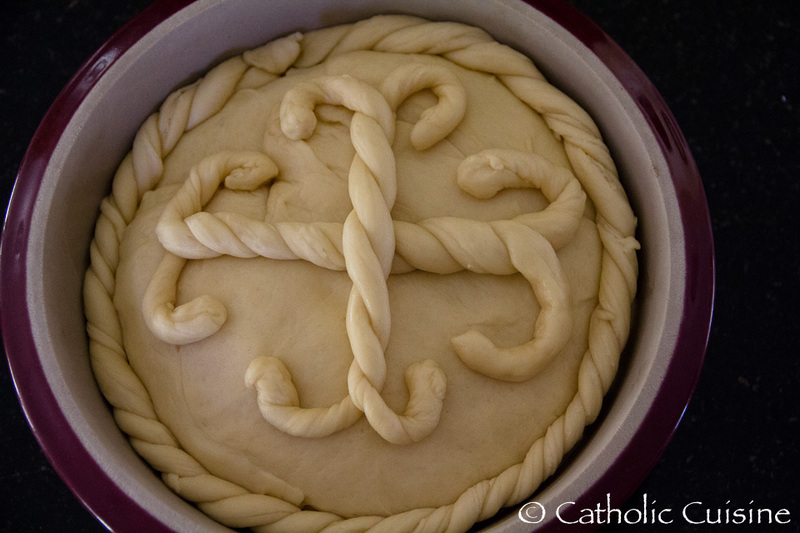 The following post was submitted by Lori from Busy with Blessings, sharing the "Passion Pita Pizzas" she created with her children last year on Good Friday. Thank you Lori! 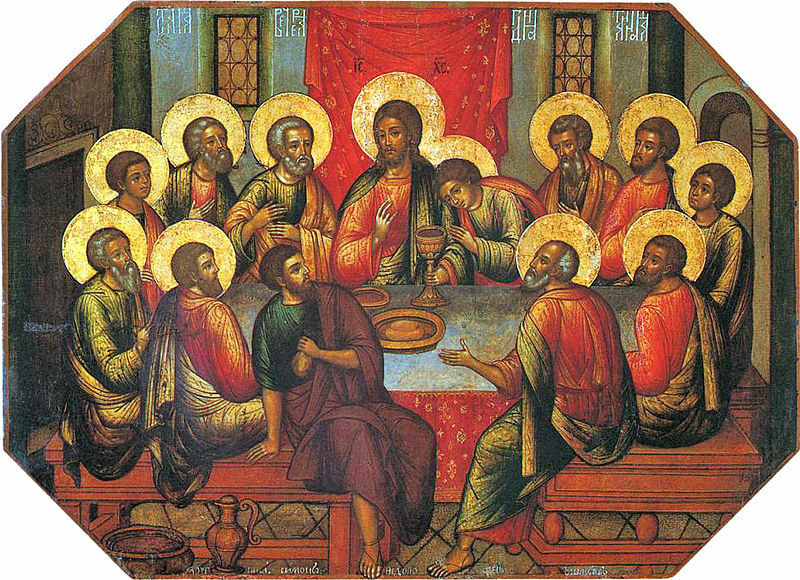 First we took a pita and discussed how the stripes remind us of Our Lord's scourged body and that by His stripes we are healed. We are also thankful that He gives His body to us in the Holy Eucharist to strengthen us along our journey. 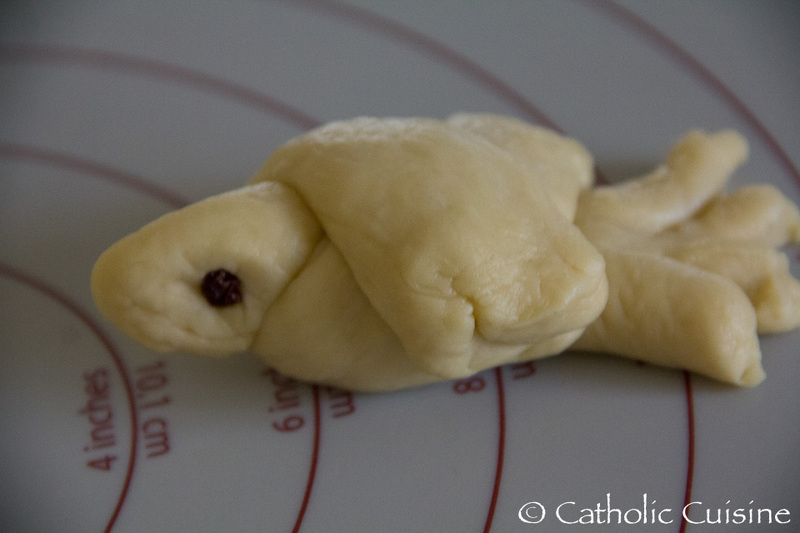 Next we spread the pizza sauce to represent the blood He shed for us and for all so that sins may be forgiven. 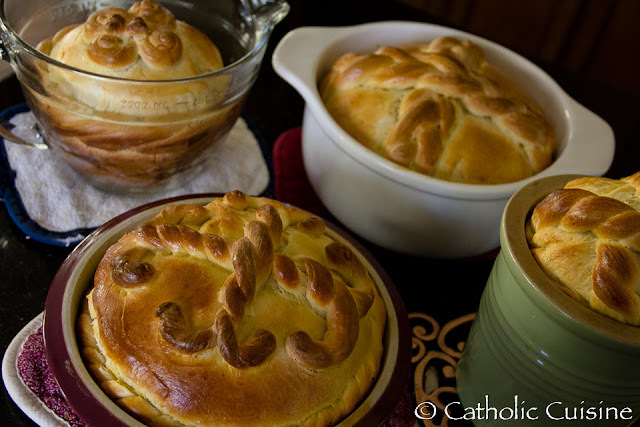 The white cheese and mushrooms were added to represent purity from sin. We added green bellpepper in the shape of a cross to represent life. Black Olives were added for His 5 Wounds. Onions were added last to represent tears shed. I sprinkled a little more cheese on the top and baked them for about 10 min., keeping an eye on them so they didn't burn. 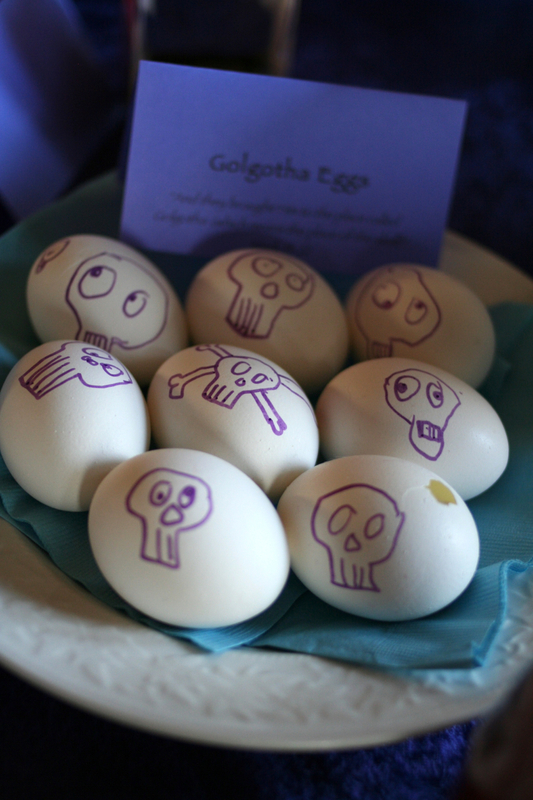 They are very symbolic and yummy! Lord by Your Cross and Resurrection You have set us free, You are The Savior of the World! 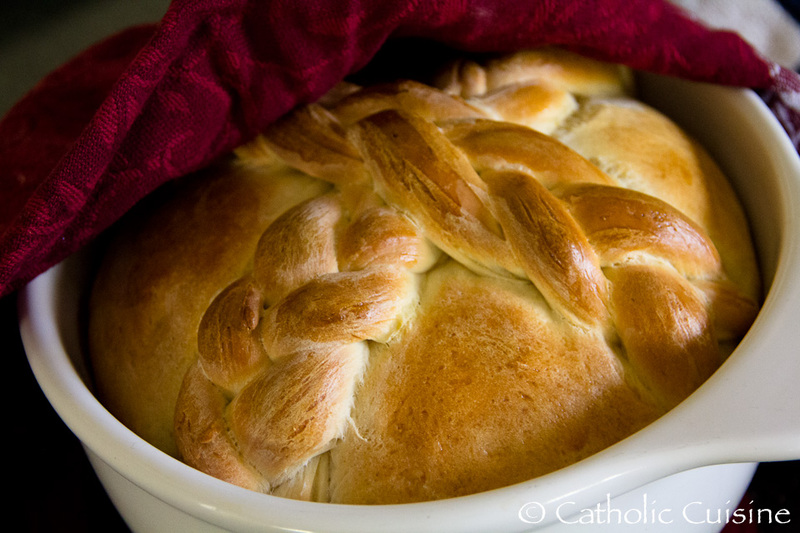 The following recipe for Holy Thursday was submitted by Frank Speyerer. Thank you Frank! Gumbo z'herbes is the least common of the three traditional gumbos we eat in New Orleans, and it's nothing like the other two. For one thing, it doesn't usually contain a roux. In its most rigorously constituted form, there should be no meat or seafood in gumbo z'herbes. This is penitential gumbo for Lenten eating. However I add bacon and a ham hock for seasoning. The name is a contraction of gumbo aux herbs--gumbo with greens. The more different greens it contains, the better the gumbo z'herbes. The tradition says that you must have an odd number of greens in there or risk bad luck. Whatever number of different greens you use will be the number of new friends you'll make before next Easter. , green leaf lettuce (not iceberg) or cabbage. More gumbo z'herbes is served during Holy Week than all the rest of the year combined. It was a family tradition that my Mère (grand-mother), Louise Egan (1883-1955) cooked gumbo z'herbes (without meat) on either Holy Thursday or Good Friday. Wash the greens and drain well. Cut out the stems center ribs from the greens. Tear the greens into small pieces. In a black cast iron pot, sauté the bacon over medium heat until it is translucent and the bottom of the pot is coated with the rendered bacon fat. Sauté the onions and garlic until soft. Add the greens and the cubed turnip. Add the water and wine to cover. Add the ham hock and seasonings and bring pot to a boil over medium heat. Reduce the heat to low and continue to cook until the greens are tender, about 2 hours. Serve greens hot with their cooking liquid or "pot likker”. This type of seasoning base is used in many New Orleans restaurants, from Emeril's to Commander's Palace to K-Paul's. This is particularly good on grilled chicken or duck. Note: This version of Creole seasoning contains salt -- If you like to control salt content separately, omit the salt from the blend. In a medium bowl or food processor combine salt, paprika, cayenne pepper, white pepper, ground black pepper, granulated onion, granulated garlic, crushed basil, crushed oregano, crushed thyme and parsley. Mix thoroughly. Use like salt. When it's salty enough, it's seasoned to perfection. Store in an airtight container for up to three months. Note: The amounts in this recipe are given by volume. So a "teaspoon" can be a cup or a Tablespoon depending on how much seasoning you wish to make. Double or triple the recipe as you wish. 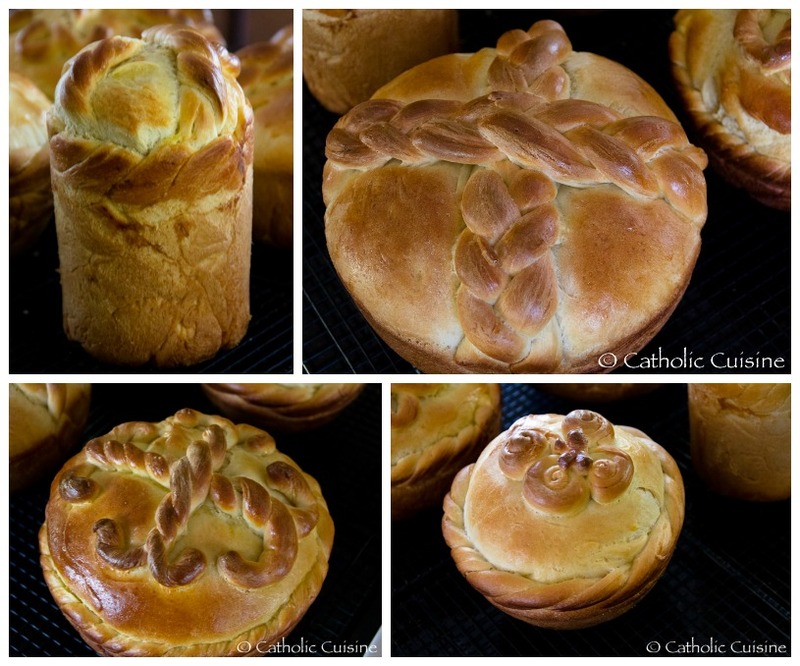 In 2009 I posted about Festive Easter Breads and Cheese. My cookbooks are full of margin notes, so I thought I would update my notes on the recipes. This is crossposted with my food blog, Family Food in Feast and Feria. 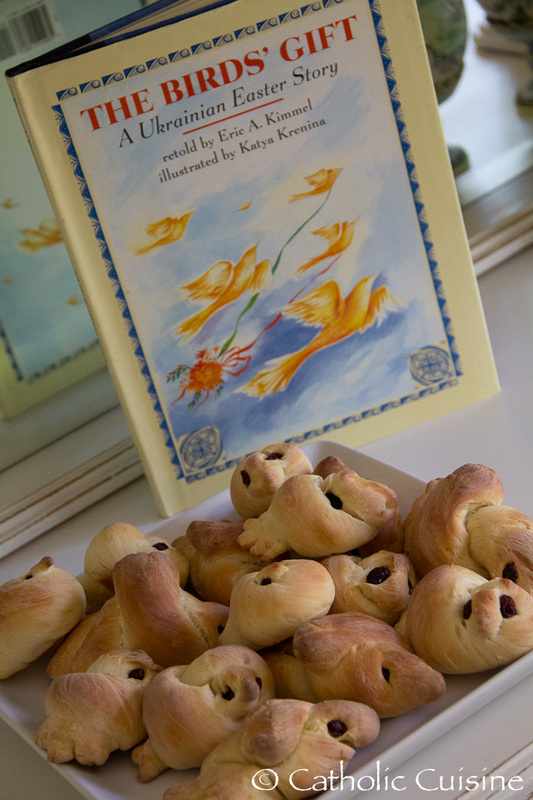 We enjoy spreading Pascha, the Easter Sweet Cheese Mold on the Paska, just like in one of our favorite children's books, Rechenka's Eggs by Patricia Polacco. At first I was a bit confused, as the name for the dessert cheese is Pascha (or Pashka), very close to the Ukrainian name for the bread. And “Pascha” is the Orthodox name for Easter. Once I got the names sorted out, I was convinced I had to try the cheese. I didn’t have an “official” mold, so used the clean clay unglazed flowerpot. Be sure to make ahead (the recipe says 2-3 days. 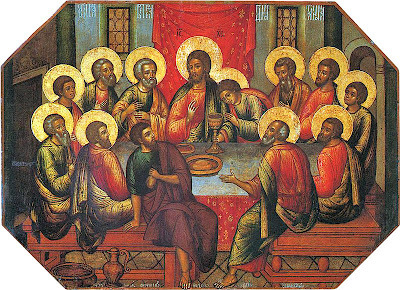 Wednesday or Holy Thursday is probably the latest). I omit the candied fruit and the almonds, as I want a smoother, creamier texture. My husband always requests this so I have been working on improving this every year. This is an absolutely beautiful and delicious dish; versions are prepared in Poland, Russia, the Ukraine, and Latvia. It is made in a tall mold (or flower pot), then turned out onto a large platter and decorated. Cool and rich, it tastes like a cross between ice cream and cheesecake. It goes wonderfully with other the sweet Easter breads, such as Kulich, or Paska Or Easter Sweet Bread or with various Easter cakes. There was some discussion of the "farmer cheese" from the previous post. This is a more difficult ingredient to find. My grocery store carries this, the brand is "Friendship", but you can try ethnic grocery stores. Some people have had success with Mexican queso fresco. It is NOT an aged hard cheese, but a soft and crumbly, almost like ricotta, or a softer version of feta. It is usually found near the yogurt, cottage cheese and/or sour cream, but not in the cheese section. If you cannot find farmer's cheese and need to use large curd cottage cheese or ricotta, rinse the cheese with cold water and drain well in a fine colander. Ricotta might need to just be drained. Then take a fine mesh strainer and press the cheese through to make it finely sieved and ready to mix. I’ve had trouble over the years having the mixture drain well so it becomes firm. Last year was my most successful year. 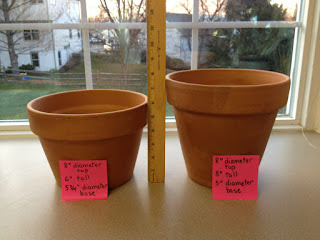 The flowerpot that works well for me is an 8″ clay flowerpot. But I have found the shorter and wide flowerpot drained better than the tall pot. The picture below shows the two 8″ pots, but the one on the left is the one I use for both the bread Paska and the cheese spread. These are just clay pots made in Italy that I found in my local gardening store. I cleaned well before using. After covering with cheesecloth, I place a small plate on top, then used a weight (literally, one or two of my husband’s free weights) and then put the pot in a large bowl. Last year the bowl was shaped that the pot was suspended above a few inches, instead of flat on the bottom. This allows more draining. For decorating I just keep it simple. And face it — no matter how beautiful the presentation, after one small serving it never looks "pretty" again. But that doesn't matter, because it is super delicious and everyone will keep coming back for more. Beat the egg and the yolks until thick and lemon-colored. (NOTE: Using a stand mixer, this is about 5 minutes.) Gradually add the sugar, and beat until the mixture is thick and creamy. Pour into a saucepan and add 1/2 cup of the cream. Heat over medium-low heat, beating constantly, until the mixture begins to thicken. Do not boil. Remove the pan from the heat and continue beating until the mixture has cooled to lukewarm. Line a flower pot or Pascha mold with 2 thicknesses of cheesecloth. 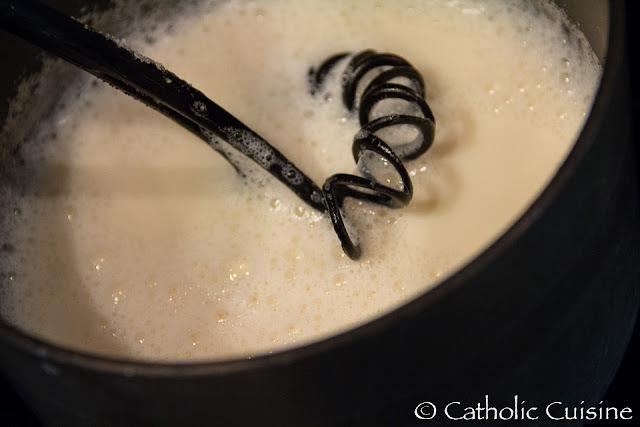 Place the pot over a bowl (to catch liquid), and pour the Pascha mixture into the pot. Put a layer or two of cheesecloth over the top, set a plate on it and something heavy on the plate. 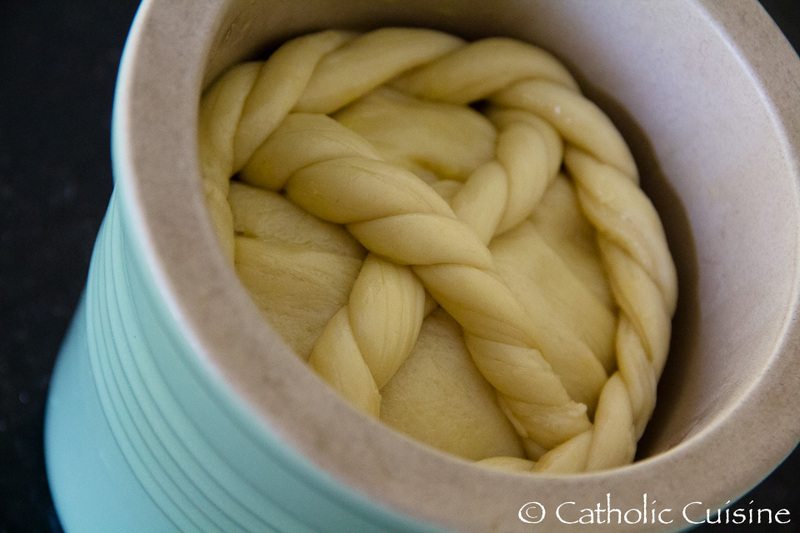 (The purpose is to press the extra liquid out of the Pascha and into the bowl below.) (NOTE: After pouring into the mold, I put a plate and then weigh it down. I gradually add more weights, my husband's free weights, after the mixture has chilled longer. Try to place a plate that covers the whole top. There will be oozing over. Do not panic.) Chill overnight or for a day or two. Remove the top cheesecloth. 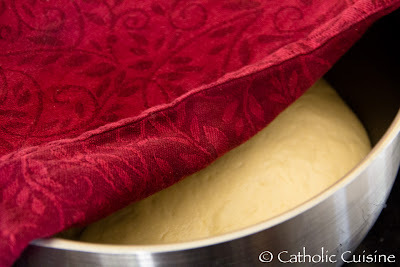 Unmold the Pascha onto a large platter, and remove the rest of the cheesecloth. 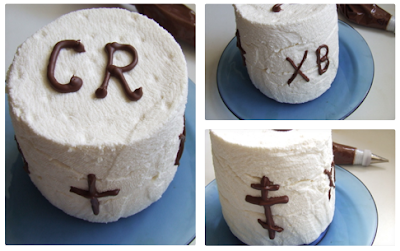 Decorate the Pascha with the candied fruit peel or maraschino cherries or nuts to form the letters XB or CR (Christ is risen) on one side, and on the other side a cross. You may use the Western cross form or the Orthodox cross, or any other cross design that you prefer. In Russia, Pascha is often decorated with an angel and a lily, as well as the cross. Around the base and on top of the Pascha, place fresh strawberries. Serve chilled. The best part after making these goodies, was arranging the Easter basket for a blessing at our parish by the pastor. I included our Easter eggs, pysanky, ham, wine, butter lamb, paska and pashka. This year I bought a simple Easter basket cloth made by some Catholic ladies in Johnstown, PA, which I can't wait to use. Pascha molds. I got two red plastic ones. The symbols did not leave an imprint on the molds, but they did drain well! I highly recommend going this route. A blessing on the Paschal feast, and your celebration! In 2009 I posted about Festive Easter Breads and Cheese. My cookbooks are full of margin notes regarding these recipes, so I thought I would update and share my notes. Crossposted with my food blog, Family Food in Feast and Feria. For the Ukrainian Easter Bread, Paska, I now adapt a recipe from Celebration Breads: Recipes, Tales, and Traditions by Betsy Oppenneer. I highly recommend this cookbook– it is very detailed instructions and diagrams. The details on the recipes are two pages long, but basically you can compare the previous recipe for Paska. 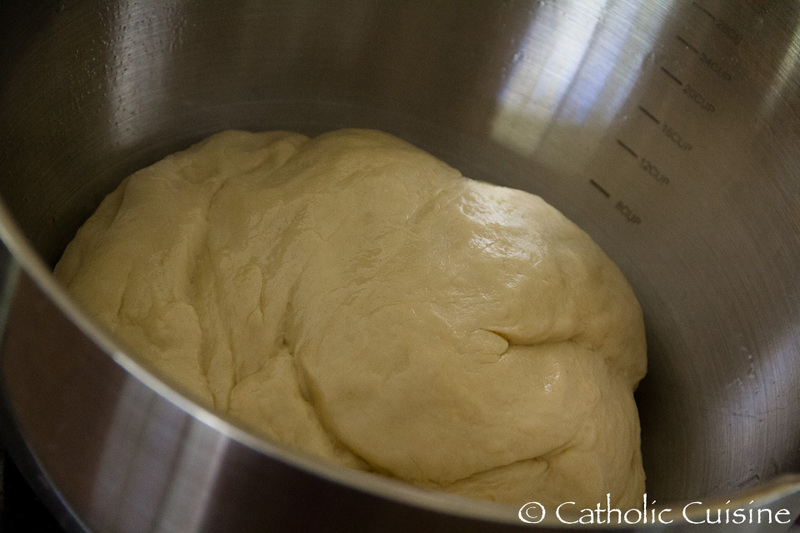 Using a mixer: Sprinkle the yeast in the water to soften in the mixer bowl. Add the milk, yolks, butter, sugar, zest, vanilla, salt, brandy and 2 cups of the flour. Beat on medium-low for 2 minutes, adding the flour 1/4 cup at a time until the dough pulls away from the sides. Add raisins and mix. 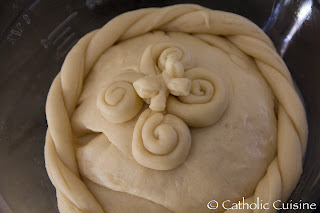 Change to the dough hook and and continue kneading on medium low, adding a tablespoon at a time. Bake for 25 minutes until the internal temperate of the bread is 190 degrees F. Remove the bread from the pans immediately let cool on a rack.